First Name and Last Name please! What organisation are you representing? Please complete this with all known dialling codes! Property related inspections cover damage assessment, job-scoping, condition assessment, portfolio management, weather tightness, as well as pre-sale or pre-purchase assessments. This is even before considering Property Management and Real-Estate inspections. All demand expertise as well as a thorough approach - always with an eye to keeping costs down and efficiency high. This is what Clarinspect delivers to this sector. Currently we are seeing a number of large property consultancies taking up Clarinspect for commercial property condition rating systems. One commercial client saves over $100,000 per year through process simplification with Clarinspect. What on earth did I write on my paper inspection sheet? Why am I spending so much time downloading and renaming photos? There must be a way of automatically getting my photos formatted into my report? How can I spend more time on site to do a more thorough job? Depending on your inspection, you may recoup between 20% and 50% of the time you used to spend on manual inspections. We have one client who is saving 4.5 hours per report by using Clarinspect. What would you do with that saving? 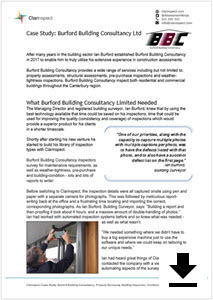 Click for Burford Building Consultancy Case study. Free Inspection Types from the Library! The following are examples of forms and reports from the Clarinspect system and are to show what could be done. They have been anonymised. Each Assessment/Inspection is shown on a mobile device and also with at least one output format (usually a MS Word Document). The forms and report templates are customisable and all reporting is rapid and cloud-based. ... or we build new ones for you! Creating a new Inspection Type including reports (there may be multiple) can take as little as 10 hours. We do this based on your templates so you know what we deliver is fit for your purposes. Used to generate a new Inventory or to compare the previous inventory with the current inspection. Includes multiple bedrooms, bathrooms, toilets, garage and also supporting photographs. Used to generate a periodic inspection os a rental property. Includes multiple bedrooms, bathrooms, toilets, garage and also supporting photographs. Based on the NZ standard for pre-sale housing inspections. This includes support for multiple rooms, photograph of each room, and exterior, roof and underfloor specific inspections. We respect your privacy. These details will only be used for our newsletter. All trademarks, service marks, trade names, product names and logos appearing on the site are the property of their respective owners, including in some instances Clarinspect. Any rights not expressly granted herein are reserved.